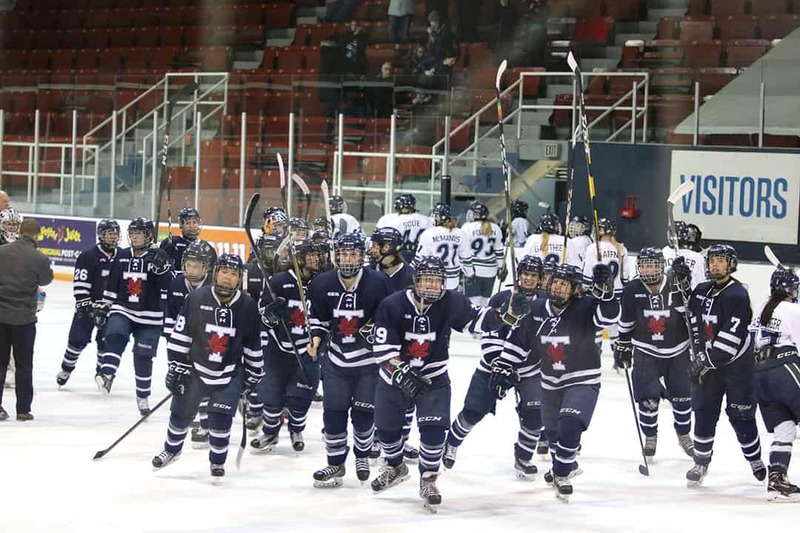 Though the Varsity Blues women’s hockey team settled for silver against the Guelph Gryphons in the McCaw Cup Final on March 9, that game wasn’t the end of their journey. The team had their eyes set on an even bigger prize: the 2019 U SPORTS national championship. It’s been 18 years since the Blues won the national championship. 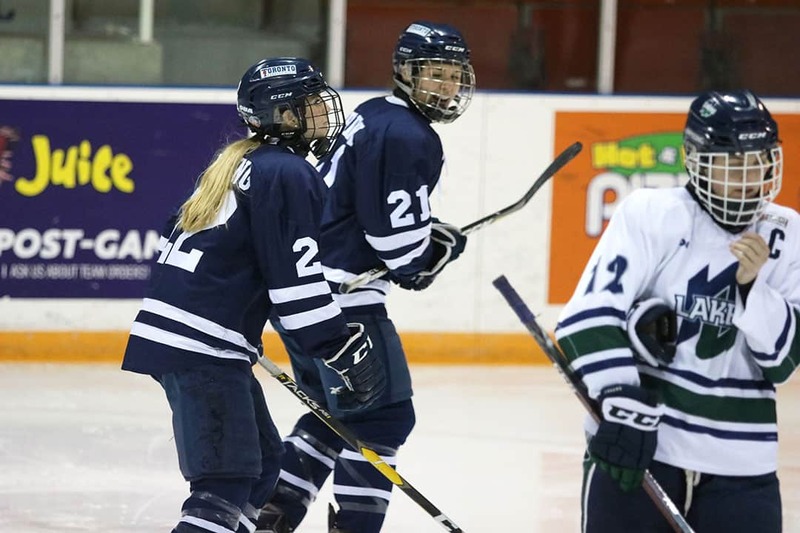 This year, the underdog Blues had looked to make some noise against the top-seeded Alberta Pandas while fifth-year forwards Kassie Roache and Meagan O’Brien had hoped to end their varsity careers with a national championship. Unfortunately, they fell short. Roache and O’Brien credit their extensive athletic backgrounds as the key to their success. Roache started playing hockey at the age of four. “I started skating when I was about two, my parents made a rink in the backyard. And then I started officially playing hockey at age four,” Roache says. O’Brien peaked a little later in her career. “I was put in the Timbits hockey school program when I was seven years old. So that was the first time I ever geared up in my equipment,” O’Brien notes. O’Brien and Roache both are avid Maple Leafs fans and they grew up idolizing several Leafs players. “If you look at my closet, you can see about five different sizes of a Matt Sundin jersey because I just kept outgrowing it. So that was definitely my favourite player growing up,” O’Brien explains. “I really liked Curtis Joseph and Tie Domi,” Roache adds. The pressure of playing for one of the top schools in Canada can add some serious weight to one’s shoulders, especially as a rookie. Roache notes that her experience in her first year was quite different from what she was used to. “When I came in, I think I was one of two people that didn’t play junior, which is the highest level. So not playing at a pace that the other girls were used to, I felt like I was a step behind,” she says. O’Brien agrees with the difference in the overall atmosphere as well. “Especially coming from a team where you were just a senior and you know, probably the leading goal scorer. You come in and you’re like a little fish in a big pond all over again,” she says. Although playing for a university was certainly different, O’Brien tried to make the best of it. “As a rookie on the team there was obviously pressure to try to keep a spot on the lineup, but we just always tried to constantly remind ourselves to enjoy every moment, even if it wasn’t exactly what we wanted, or if we weren’t getting the ice time we now get,” she explains. Now both players are in their final year, and have gotten used to the intense schedule of a student athlete. O’Brien stresses the importance of friends and family too. “I have the privilege of living not too far away from all of my family in Brampton, so on our days off I’ll try to go have dinner with my parents or my grandparents, or my baby sister… you know, just remind yourself that hockey and school aren’t everything,” she explains. Both take the time to be regular students though. “If I need a break from studying, I’ll just pick up a guitar and start playing,” O’Brien says. Roache, like a lot of students, enjoys watching Netflix in her spare time. The two players recognize the importance of having a family-like bond with their teammates. “I feel like without the support from teammates, sometimes you wouldn’t make it through your days,” Roache says. “We’ve always got each other’s backs. And don’t get me wrong, you go through trials and tribulations together… But you celebrate your successes with them,” O’Brien adds. Both players will be walking away from the game to see where the future takes them. “I’m currently waiting on results of certain applications, but as for my next plans I don’t really know exactly where I’ll end up. But I know I want to end up in medical school and hopefully become a doctor one day,” O’Brien says. At the end of the day, being able to put on that jersey and represent U of T carries a deeper meaning for varsity players. “It’s an honour and a privilege, and I think I’m just going to miss that student-athlete life and you know, being surrounded by the best teammates ever,” O’Brien says. 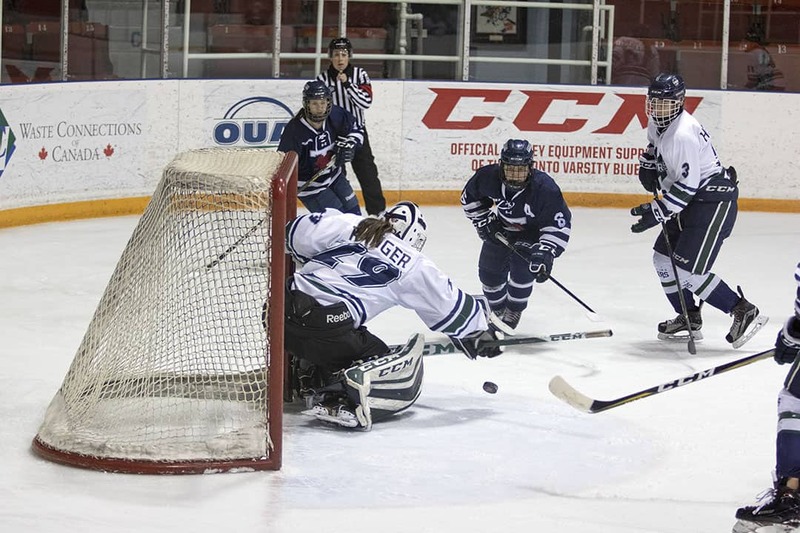 In their first McCaw Cup Final in a decade, the Varsity Blues women’s hockey team fell short of the Ontario University Athletics (OUA) title in a 4–2 loss against the Guelph Gryphons. Guelph hosted the final, after posting an OUA-best 16–4–2 record in the regular season. Kassie Roache opened scoring for the Blues, receiving a well-timed pass from Kiyono Cox and wiring a slap shot into the top corner to give the Blues a 1–0 lead. The Gryphons didn’t answer back until there were five minutes left in the opening period; Mallory Young tipped a pass to Claire Merrick, who shot past Blues netminder Erica Fryer to level the score at 1–1. Fryer was busy early and often in the first period as the Gryphons forced her to make seven saves. The rookie was well poised between the pipes, making 14 saves by the end of the second period and allowing just one goal from the highest-scoring offense in the OUA. But the Gryphons outmatched the Blues in the third period, scoring three unanswered goals to pull away in a contest that had been otherwise level from the opening face-off. Katie Mikkelsen’s power-play goal 31 seconds in saw Toronto’s one-goal lead evaporate. Kristen Jay put the Gryphons ahead 3–2, with Merrick scoring a late goal to end any hopes of a Blues comeback. After a strong 60 minutes, the Gryphons lifted the McCaw Cup for the third time in the past four years. Despite the loss, the Blues season continues next week as they head to Charlottetown in Prince Edward Island for the chance to capture a national title at the USPORTS National Championships. 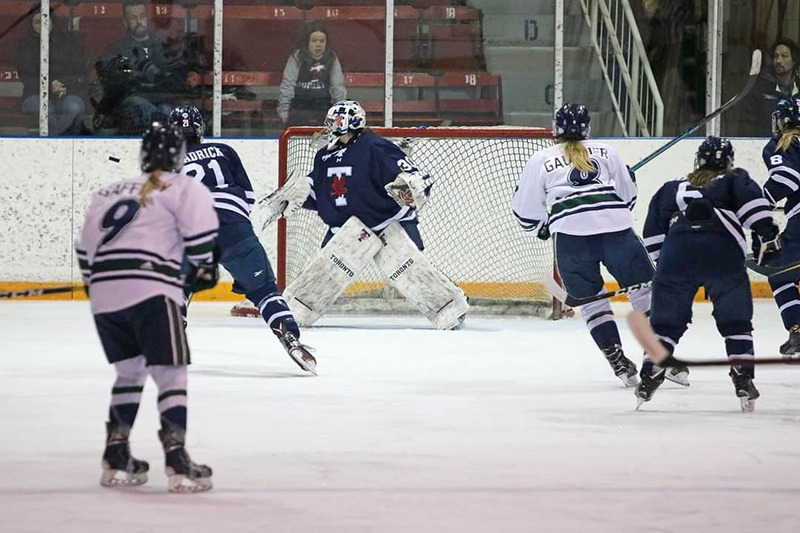 The Varsity Blues women’s hockey team is headed to the McCaw Cup Final after defeating the Western Mustangs 2–1 on Saturday at Thompson Arena. The victory came less than 24 hours after the Western Mustangs forced a winner-takes-all match with a win at Varsity Arena in the best-of-three OUA semifinals. 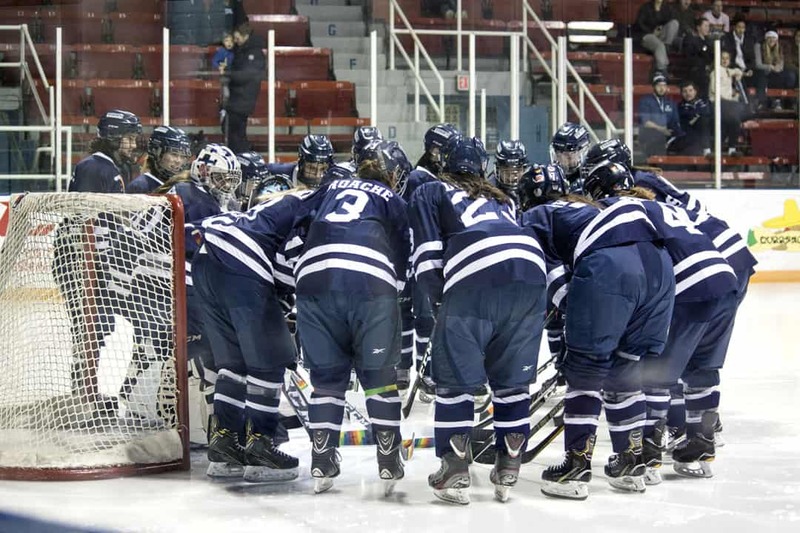 This is the Blues’ first trip to the OUA women’s hockey finals in a decade. Blues fourth-year forward Jessica Robichaud scored the opening goal of the contest midway through the second period. Fourth-year forward Stephanie Ayres’ pass deflected off a Mustangs defenseman and Robichaud corralled the loose puck, launching a quick shot to beat Mustangs goaltender Carmen Lasis. The Blues found themselves in multiple shorthanded situations throughout the second period due to their undisciplined play. Toronto committed three penalties in the period and a total of five in the game, while Western only registered two. 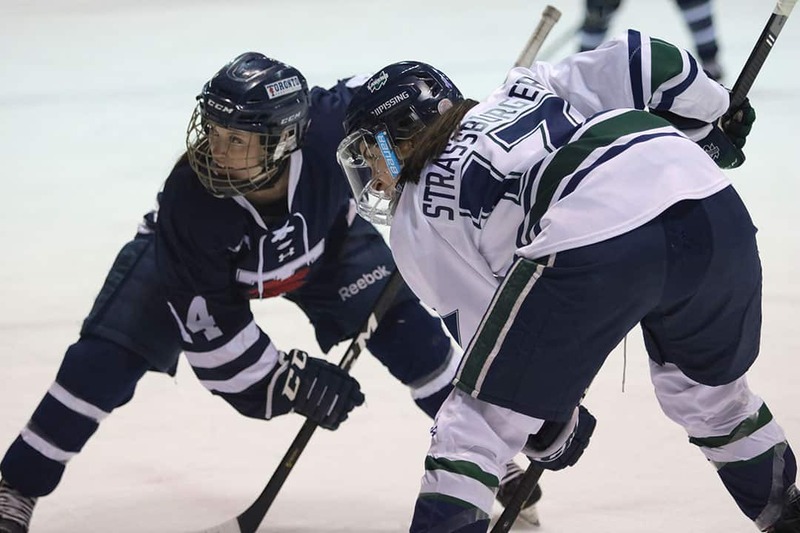 Mustangs third-year forward Sydnee Baker capitalized on Megan O’Brien’s body checking penalty late in the second period with a powerplay goal to even the score at 1–1, with less than four minutes remaining in the period. Blues fifth-year defenceman Julia Szulewska tallied the game-winning goal for the Blues with six minutes left in the third period. Louie Bieman played a sharp-angled pass across the crease, and Szluewska fired the puck five-hole and past Lasis. Western scrambled to level the score in the final minutes of the game. Mustangs head coach Candice Moxley pulled Lasis, with 90 seconds remaining for the extra attacker. While the Mustangs’ overwhelming puck presence forced Blues first-year goalie Erica Fryer to make a few sprawling saves in the final moments, Western was unable to find the back of the net. Fryer continued her strong play this season, recording 22 saves. With their victory over the Mustangs, the Blues will face the Guelph Gryphons on March 9 in the McCaw Cup Final and have earned a bid to the U SPORTS Championship. Blues second-year forward Louie Bieman attempts to corral the rebound away from Lakers second-year goaltender Danika Ranger (Click to Expand). Blues fifth-year forward Lauren Straatman and Lakers second-year forward Sam Strassburger stay focused in anticipation for the face-off (Click to Expand). Blues fifth-year forward Meagan O’Brien attempts to get back into the play (Click to Expand). 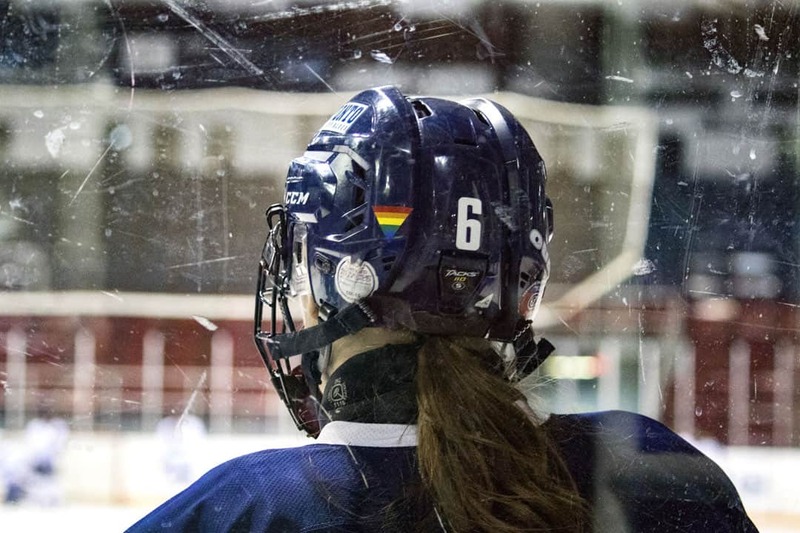 Blues first-year defenceman Jana Headrick looks back at captain Becki Bowering (Click to Expand). 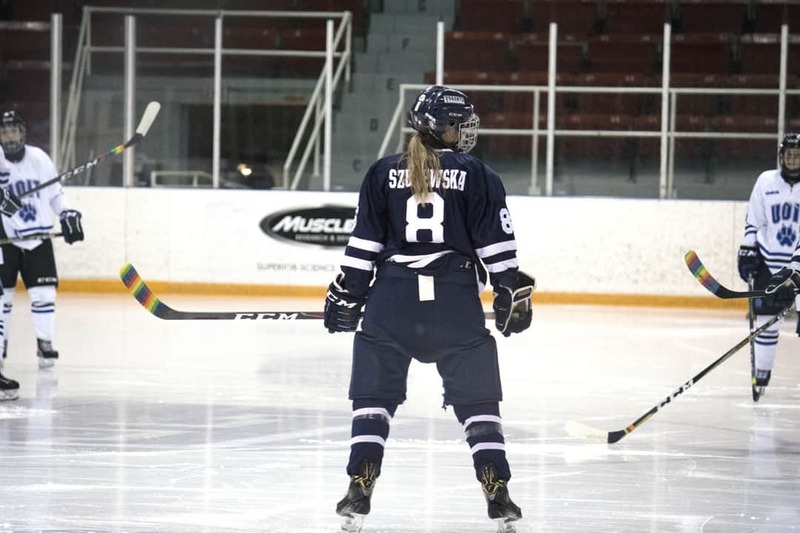 The Varsity Blues women’s hockey team opened the OUA playoffs with a convincing 3–1 victory over the Nipissing Lakers on February 20 (Click to Expand). 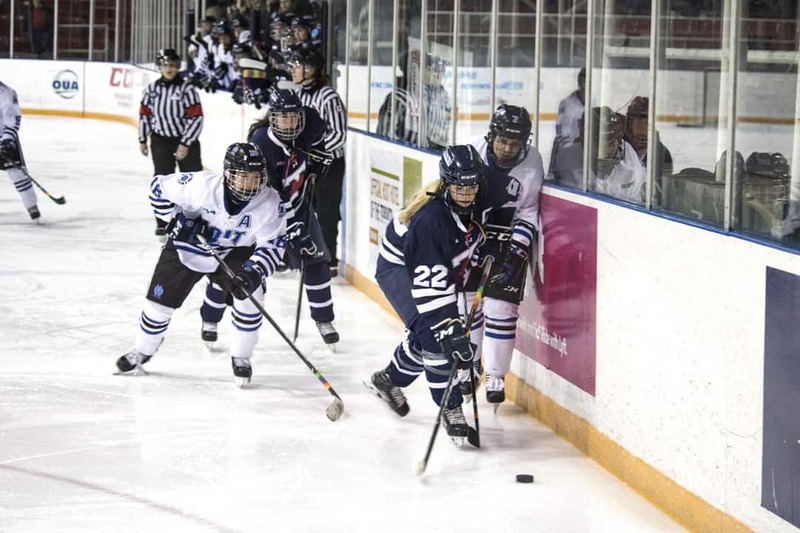 The Toronto Varsity Blues women’s hockey team suffered a 3–1 loss against the Waterloo Warriors on Saturday afternoon. Waterloo put a goal on the scoreboard to open up the game with a tip shot by fourth-year forward Alison Hanson, giving the Warriors a 1–0 lead to end the period. Despite the Warriors’ early lead, the Blues managed to generate eight shots on goal to the Warriors’ five. The Warriors’ lead quickly disappeared as Blues forward Louie Bieman tied the game with less than 10 minutes remaining in the second period. Waterloo’s offense appeared to be more aggressive, generating more shots than Toronto’s. With less than five minutes in the period, the Warriors jumped to another lead as forward Angela MacDonald scored, giving them a 2–1 advantage. Toronto could not find any momentum as the Warriors’ late push carried them into the final period. Toronto found themselves on the penalty kill twice early on in the third period, reducing their chances of tying the game even more. First-year forward Taylor Trussler committed both of the penalties by bodychecking and boarding. The Blues could not get past Warriors goaltender Amanda Smith in the final period. Samantha Burbridge sealed the game for Waterloo with an empty netter in the final minute, giving the Warriors a 3–1 victory. Toronto’s first-year goalie Erica Fryer made 14 saves in the loss. Smith stopped 18 of 19 shots. 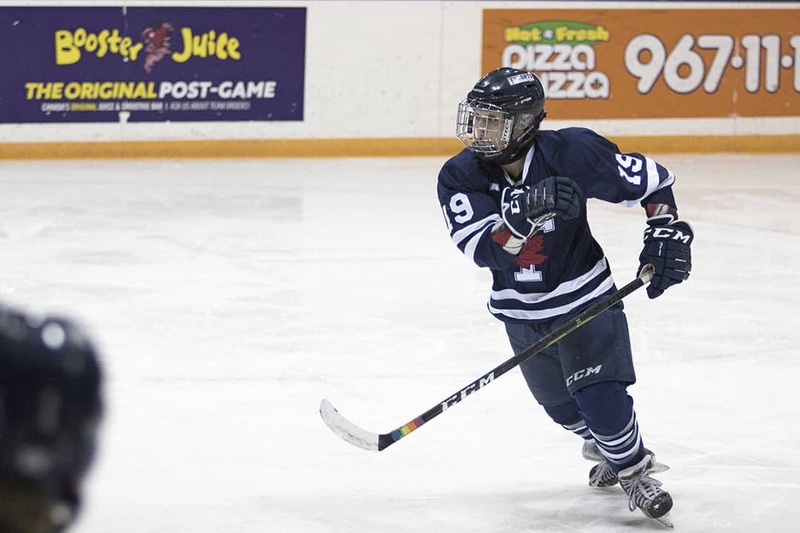 Supporters turned out to watch the Blues women’s hockey team kick off their regular season in fantastic fashion on Saturday night, as the squad posted a 5–3 comeback victory over the Windsor Lancers. It was a true team effort for the Blues, as five different players scored and 10 recorded points on the evening. Toronto dug themselves into a hole early, as Windsor fired off two quick goals in the first four minutes. The Blues caught a tough break later on in the period, as Taylor Trussler and Louie Bieman were sent to the box for minor penalties about a minute apart. Amy Maitre was quick to take advantage of Windsor’s five on three advantage, converting on powerplay to put the Lancers up 3–0 with five minutes remaining in the first. Maitre’s goal proved to be the last for the Lancers, however, and Toronto remained poised, relying on its veteran leadership and the strength of its forecheck to counter Windsor’s chippy, physical play. Stephanie Ayre’s goal from Trussler and Mathilde de Serres with about 30 seconds left in the frame was “really big” for the Blues, said Bieman, proving to energize both players and fans alike as the Blues headed into the first intermission down 3–1. The latter two periods were all Blues, as Toronto scored four unanswered goals between the two periods to put the game away. The home side upped its intensity on their forecheck and absolutely dominated the second period, with the visiting Lancers struggling to even advance the puck past the centre line out of their own zone. Lauren Straatman scored a powerplay goal on the back of some great puck movement from Cristine Chao and Louie Bieman to cut the lead to just one point with 12 and a half minutes to go in the second, while Kassie Roache tipped in a beauty feed from Jana Headrick just three minutes later to tie it up at three apiece. The Blues came storming out of the gates in the third, bringing fans to their feet as de Serres buried the go-ahead goal off an Ayres rebound just a minute into the period. Bieman provided the insurance marker with six minutes left in the game, showing off some nifty stick work to deke out the Windsor tender right in front of the crease and making it 5–3 Blues. Second-year goalie Madeline Albert was solid, stopping 18 of 21 shots for the win.